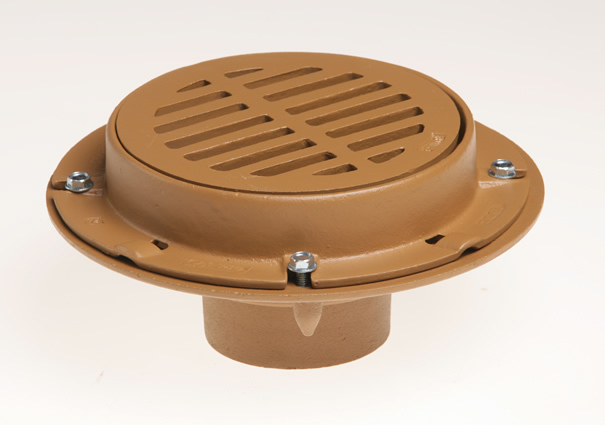 2110 Medium Duty Floor Drains with 8 1/2" Round Tops - Jay R. Smith MFG Co.
Used in moderate traffic areas where waste water contains no sediment or debris and floor construction requires shallow drain body. Body flange and flashing collar serve as anchor in on-grade locations and as flashing clamp when installed in waterproof floors. Duco Cast Iron Body and Flashing Collar with Cast Iron Bar Grate. Smith No. 2110 (-U) cast iron drain and modified vandal proof secured grate. Smith No. 2115 (-U) modified as above for side outlet. Smith No. 2110 cast iron drain and flashing collar with grate. Smith No. 2115 for side outlet. Smith No. 2110 (-S-H) cast iron drain and hinged grate. Smith No. 2115 (-S-H) for side outlet.